As per the American Academy of Dermatology, topical acne scar treatments can help reduce their appearance but cannot remove them completely. Having said that, there are a number of over-the-counter and prescription medications to help smoothen and even out raised scars and diminish skin discoloration. Consult your dermatologist for advice on which treatments are best for you, considering their severity and your skin type. 1. 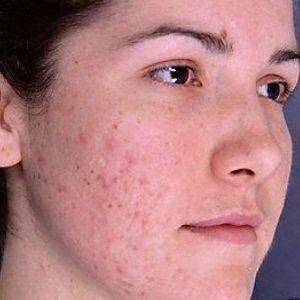 Over The Counter Nonprescription Acne Creams: According to the American Academy of Dermatology, some over the counter nonprescription acne creams that contain glycolic acid; vitamin C and retinol can treat depressed acne scars and make them less visible. These products help the body to generate more collagen, which plumps skin. For skin discoloration, you can opt for over-the-counter skin-lightening creams to help even and smooth your skin tone. 2. Chemical Peels: A chemical peel treatment uses application of mild solutions for skin refinement and regeneration that can smooth depressed scars and even skin tone. To quote Dr. Bowe: “Products containing glycolic acid promote cell turnover, which is a process in which new skin cells form and help even out your skin tone.” Consider using an over the counter chemical peel containing both glycolic and salicylic acids to help fade spots by exfoliating dead skin cells and smoothing out skin texture. Or, your dermatologist can prescribe you a stronger peel based on your skin type and on the severity of scars. Lighter chemical peels are available for mild scarring and don’t require much healing time. If you have more severe scars, deeper peels are recommended that may take a couple of weeks to heal. Many times chemical peels have need of some follow-up care like sun protection, a particular cleansing regimen or antibiotics to prevent infection. 3. Skin Lighteners: If you have marks that are more brownish in color, skin-lightening ingredients like retinol, vitamin C, hydroquinone, kojic acid, or licorice can help. However, in case of pink or red acne marks which are not related to the skin’s pigment or melanin then the above-said skin lightening ingredients won’t work. Such marks should be treated with sun protection and these can be lightened considerably using laser called pulsed-dye laser in a dermatologist clinic. It can normally take three treatments to get rid of them completely, but some times they fade away notably even after just one treatment. 4. Topical Vitamin C Serum: Vitamin C can encourage production of collagen and so promotes healing. Look out for an over the counter product containing pure L-ascorbic acid, which is vitamin C and penetrates into the skin so that it continues working even long after it dries. Tips: If there is no improvement within three months from using over-the-counter treatments then it may be necessary to check with your dermatologist for getting a prescription topical cream. Tretinoin helps dimnish the size of raised scars as well as gets rid of itch and pain. Corticosteroids are other options your dermatologist may prescribe that help fading away acne scarring. The use of both in conjunction may give faster results and amplify the reduction of scars. 5. Retinoids: The effect of Retin A is superficial, therefore the only scars that can be improved would be those that are extremely shallow. If the scars are deep then there are alternative options like TCA peel, dermabrasion, laser resurfacing and subcision. Retin-A helps with acne marks by causing your skin cells to divide more rapidly and pushing out the cells with the discolored pigment. It definitely gives your skin an improvement in texture as well as regulate your sebum production to prevent further outbreaks. Caution: Retinoids make your skin sensitive to the sun, so it’s best to apply a treatment in the form of a cream before you go to sleep.